Chicago police have issued a community alert after armed robbers targeted at least five CTA train passengers since Christmas. Victims have been approached while standing on Red Line trains or shortly after leaving a Red Line train by a man or men who’ve been armed with a handgun. Most recently, a victim was robbed around 3:45 a.m. at the Fullerton Red Line station, 945 West Fullerton, near DePaul University’s campus. 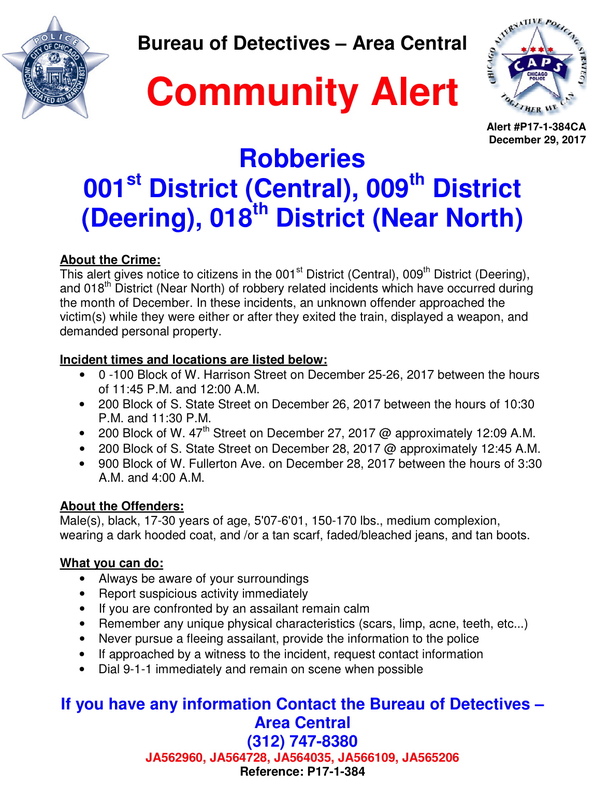 The first robbery in the pattern was reported shortly before midnight on Christmas night near the Harrison Red Line station. Receive exclusive reports and services by sponsoring CWBChicago for as little as $49 per year. Two of the hold-ups have been reported at or near the Jackson Red Line station: one between 10:30 p.m. and 11:30 p.m. on December 26 and the other at 12:45 a.m. on December 28. On December 27, a CTA passenger was robbed at or near the 47th Street Red Line station around 12:10 a.m.
Police said the offenders are black men between 17- and 30-years-old who stand 5’7” to 6’1” tall and weigh 150-170 pounds. They have been seen wearing a dark hooded coat or a tan scarf pulled over their faces with faded or bleached jeans and tan boots. 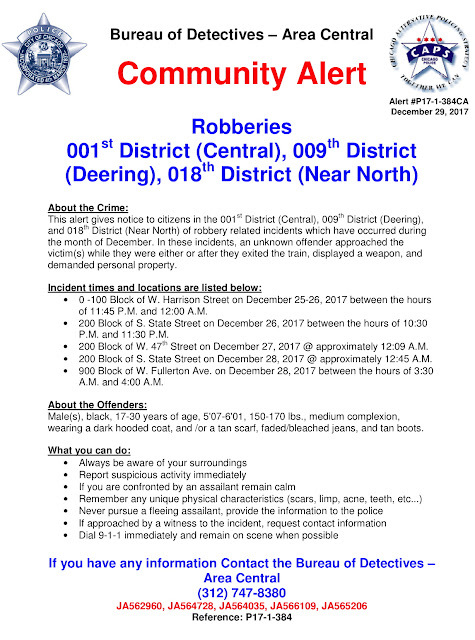 Anyone with information about the robberies is asked to call Area Central detectives at (312) 747-8380. The alert comes a week after CWBChicago reported that robberies in the Loop are up 132% in three years.